Oh my god, that was beyond my expectations. The level of writing is very high. It’s so powerful and I truly believe that the way you put those ideas and experiences into words will leave an unforgettable impression. One of the most difficult parts of a graduate school application is the personal statement. 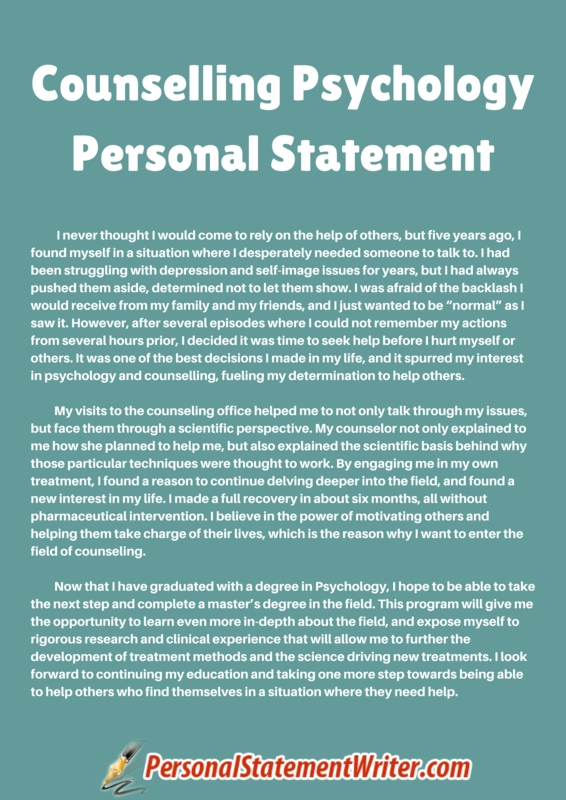 When you’re getting ready to apply, you know that a counseling personal statement is the only part of your personality that the admissions personnel will see. It’s your one chance to make an impact and convince them you’re the right fit. However, we all know that writing about yourself can be the hardest task since you’re walking on a thin line here. You can either be too self-criticizing and lower yourself in the eyes of the committee or you’ll end up bragging about yourself too much. Both of these outcomes seem horrible, don’t they? 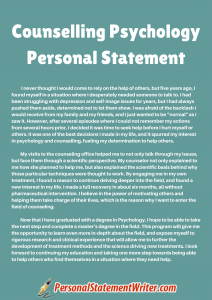 So how do write a perfectly balanced personal statement for counseling psychology doctorate? Well, check out these tips and find out. Follow these seven steps to write a great personal statement. They will get you a heads-up in whatever counseling program you’ve chosen. Check for clichés: Before you write, look up info about starting a personal statement and some writing cliches in general. Avoiding these can give you a good heads-up! Answer the whys: Ask yourself three things. Firstly, why graduate school? Secondly, why counseling? Thirdly, why this program? Answer the hows: How did your previous experiences prepare you for graduate school? How will you contribute to the program you’re planning on applying to? Create an outline: Once you’ve answered your questions to yourself, put the answers in a rough outline that you can later edit. Leave out the irrelevant stuff: At the graduate school level, your hobbies and your jobs should only be mentioned if they’re directly related to your area of study. Fill in your outline: Now that you know what should and shouldn’t be in your paper, fill in the edges of your outline. Edit: The final stage will be editing and proofreading. You want to present your best face to the person reading your letter, so make sure you have an error-free letter. Ask someone to look over it for you or, if you can’t find someone, read it backwards or out loud. 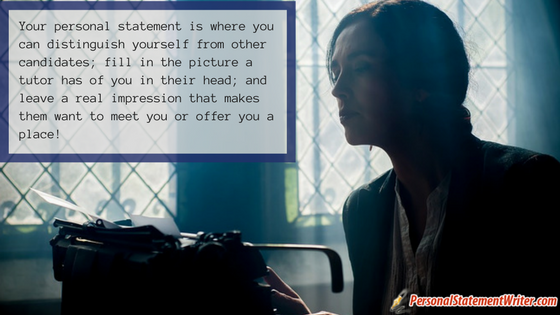 With all the pressure put on you to write a great personal statement, it’s easy to be incredibly intimidated. Don’t let yourself drown in it, however. Our best personal statement writers service will allow you to create a great statement that propels you into the next phase of your career. Whether it’s just a nudge in the right direction or a whole statement, we can help you wherever you are. Don’t wait up and start your personal statement counselling course. Our help doesn’t end on tips, we have a team of writer who can help you write a flawless counselling personal statement. Just give us a call!